Divit Singh, a member of the Crowd Lab and computer science MS student co-advised by Dr. Luther and Dr. T.M. Murali, successfully defended his master’s thesis today. Divit contributed to GraphSpace, an online hub for sharing biological network data; and GraphCrowd, an extension for crowdsourcing the visualization of these networks. Divit also conducted several experiments showing that GraphCrowd generates network layouts that are as effective as those created by expert biologists. Congrats Divit! Congrats to Ph.D. student Nai-Ching Wang, who was a finalist in graduate student division of the CHI 2016 Student Research Competition. 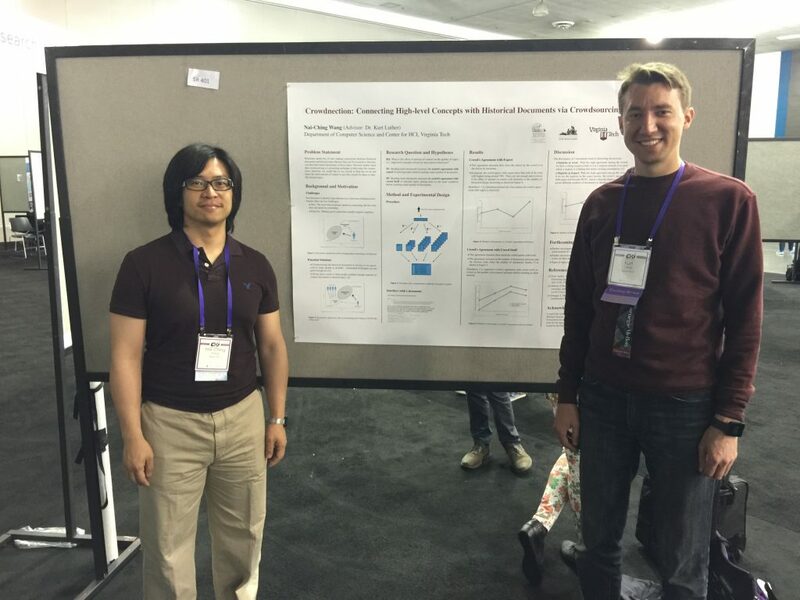 His paper is titled, “Crowdnection: Connecting High-level Concepts with Historical Documents via Crowdsourcing.” He traveled to San Jose, CA to attend the conference and present his research to a panel of expert judges.